You are looking at date code correct frame off restored 1969 Yenko Camaro clone. It started life as a Garnet Red big block with a white Houndstooth interior which have both remained true to the finished product. This car was over 3 years in the making and every component on this car is NOS, refurbished or OER. Every mechanical component of this car is date code correct. The power plant starts with a 427ci 425hp block (casting 3963512) that was completely rebuilt using the correct GM forged steel crank (forging 7115). It has the correct GM 3931065 water pump and a Winters Snowflake intake manifold (casting 3933163) connected to a Holley 4 barrel 4346 carburetor (casting 3959164) which has the correct 4519 and 5583 metering blocks. The distributor is a rebuilt 1111499 casting and is complimented by the Delco D309R distributor cap, a Delco D409 rotor, NOS Delco points, a Delco BR293 ignition coil and a Delco 1100837 alternator. The 3931063 heads were rebuilt to new condition and look awesome matched up with the correct GM exhaust manifolds (cast 3909879 LH & 3916178 RH). It all sounds just plain nasty ripping through the new OER chambered exhaust system. The ample horsepower is put to the rear end via the correct Muncie M22 rock crusher transmission that has been completely rebuilt and has the correct main case # of 3925660 as well as the correct 38575684 GM tail housing. The 12 bolt rear end (cast 3894860) has been completely rebuilt with new Richmond 4:11 gears and hooks up perfectly. There is absolutely no rust or filler anywhere on the car and the paint is of show quality. The white Houndstooth interior is all new as are all of the interior items. It has a 140mph speedometer, a NOS Stewart Warner Greenline pedestal tachometer as well as NOS Stewart Warner 2 5/8” oil pressure, water temperature and amperage meter gauges. The glass is all new as are all of the rubber seals and felts. It also has the correct date coded Goodyear Wide Tread GT E70-15 tires wrapped around a set of new American Racing 15 x 7 Torque Thrust D’s. The trunk is adorned with the correct B.F. Goodrich G78 space saver spare, a GM 486508 inflator as well as the correct jack and mounting hardware. We have spent countless hours and dollars to make this car indistinguishable between a real Yenko. Other than the color and the fact that this car is not listed in the Yenko registry there is nothing incorrect about this car. 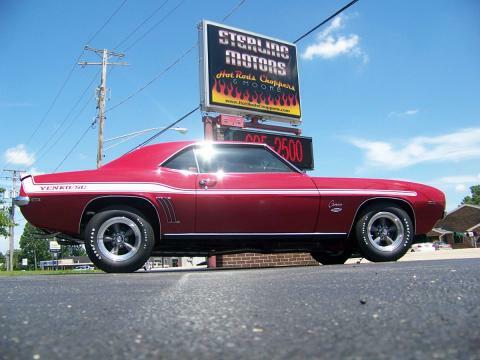 If you are in the market for a frame off restored Yenko but do not want spend $250,000 or more your search is over! This incredible car cost $95,000 to build and is being offered at $20,000.00 below its build cost!